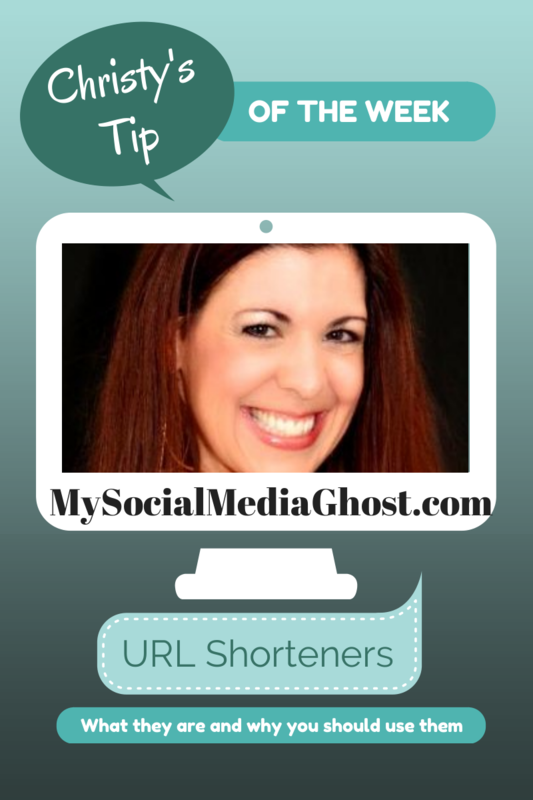 My Social Media Ghost: What is a URL shortener and why should you use one? Professional social media strategy and social media management. What is a URL shortener and why should you use one? When I am speaking to groups about easy ways that analytics can be used within social media posts I notice that I get the deer in the headlight look when I talk about URL shorteners. I would like to take a few minutes and explain what a URL shortener is and why you should be using them when you are sharing URL's on your social media sites. A URL shortener service takes your very long URL (http://christyhovey.com/live-your-strengths/personality-tests-finding/) and creates a shorter clickable link (http://bit.ly/1dbDfwt) that takes the reader to the original longer link without them knowing the difference. There are many benefits to using a URL shortener including giving you the ability to track how many people are actually clicking on the links that you are providing to your audience. Have you ever posted something on your Facebook profile and nobody has clicked like? You are not alone. When I learned about shorteners a few years ago I began to use them on my Facebook profile page and was amazed at how many people were not necessarily engaging with a post but they were clicking on it. When I found out my audience was reading but not commenting on my posts I was able to determine how to re-word them to facilitate more engagement. Another benefit of using a shortener is that mobile users can easily cut and paste your link to their notes applications or into an email. Studies show that if you make things super easy for people they are more apt to complete an action. Additionally, when you use a URL shortener you won't have any problems on Twitter if you want to Tweet out your link. Since you only have 140 characters to work with it's imperative that you have as much room as you can to get your message out and if you don't shorten a link you won't be able to talk about it much. Now that I have your interest in using URL shorteners, the next logical step is to figure out how to shorten your links, right? Bit.ly is my favorite resource to accomplish shortening and tracking your URL for free. Snoop around their site and play with all of the features. It's very easy to paste your long link and copy the new Bit.ly shortened link to any social media platform. They also have a mobile app so that you can see analytics for your links on your phone. Now that you've had a crash course in URL shorteners, you should have enough information to be slightly dangerous. It really doesn't take but a few minutes to shorten your links and the benefits of doing so are measurable and worth your time. Try using a shortener. At the very least you won't feel so bad when it seems like nobody is reading your posts - I think you'll be surprised when you find out that they actually are! Should I follow everyone who follows me? All contents of this site copyright 2012-2013 My Social Media Ghost. Picture Window theme. Theme images by suprun. Powered by Blogger.